The market continued its upwards movement so that the most recent rally came up to over 130 pips. This development was not what we expected, given the whiplash that took place at the beginning of the rally. That whiplash is giving the entire rally a corrective “feel”, despite its clear impulsive “look”. If this is indeed a correction, then the larger pattern is most likely a triangle, but its wave relationships wouldn’t be too satisfying. So the logical approach for the time being is to treat this whiplash as a volatile flat correction within a larger impulse. Additionally, the extent of this rally makes it more like that it’s the first wave of a zigzag rather than that of an impulse, so we’re making a slight modification to the larger-degree labeling. By movement below 1.1199, EURUSD would be expected to find support between 1.1190 and 1.1174, while remaining above 1.1123. 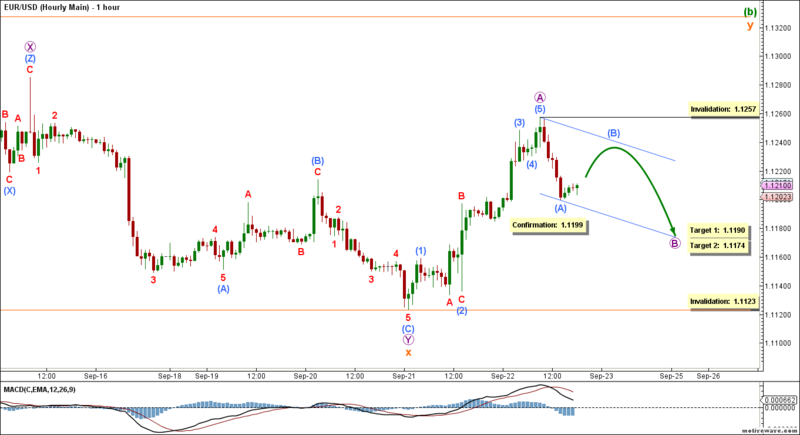 Movement below 1.1123 would take the market in a long downtrend towards the area between 1.1014 and 1.0863. Either way, EURUSD is expected to remain below 1.1257 at least for 1-2 days. Elliott Wave chart analysis for the EURUSD for 22st September, 2016. Please click on the charts below to enlarge. Orange wave x formed a double zigzag labeled violet waves W, X and Y. Within it, violet wave Y formed a zigzag labeled aqua waves (A), (B) and (C). Aqua wave (B) formed a zigzag labeled red waves A, B and C, retracing just short of 50% of aqua wave (A). Aqua wave (C) formed an impulse labeled red waves 1 through 5. Violet wave B is forming a zigzag labeled aqua waves (A), (B) and (C). It has already retraced well over 38.2% of violet wave A, but there are no signs that it’s near completion just yet. 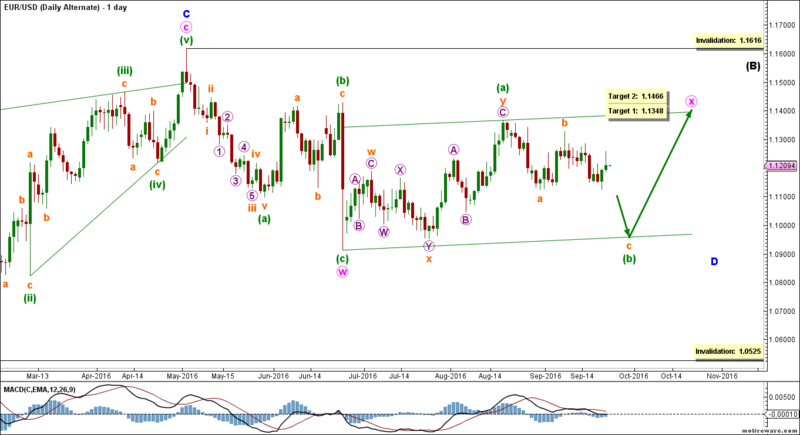 This count expects the euro soon to move towards the downside in violet wave B. This will be confirmed by movement below 1.1199. At 1.1190 violet wave B would retrace 50% of violet wave A, then at 1.1174 it would retrace 61.8% of its length. This wave count is invalidated by movement below 1.1123 as violet wave B of this zigzag may not move beyond the start of violet wave A. And if indeed violet wave B is a zigzag (and not an expanded or running correction), this wave count is also invalidated by movement above 1.1257 as aqua wave (B) of this zigzag may not move beyond the start of aqua wave (A). This alternate count is an early heads-up of the possibility that green wave (b) as a whole is complete as a running flat labeled orange waves a, b and c.
Within it, orange wave c reached 61.8% of orange wave a, which is a typical and passable ratio in a running flat. Green wave (c) is likely forming an impulse labeled orange waves i through 5. Within it orange wave i is likely forming an impulse labeled violet waves 1 through 5. 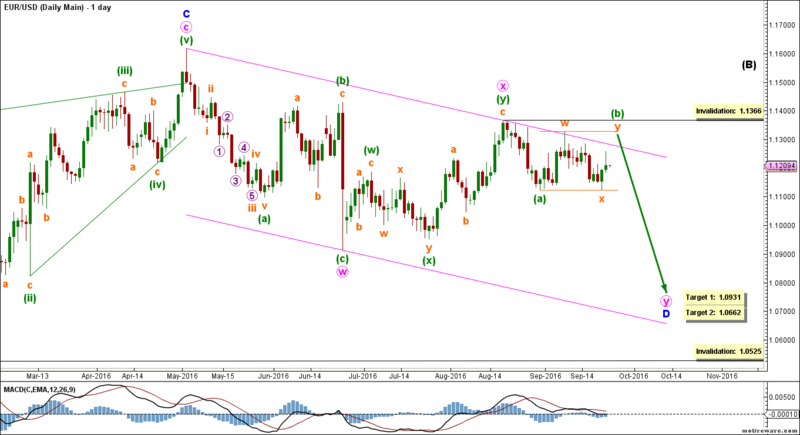 This count expects the euro to move towards the downside for several days (possibly a couple of weeks) in green wave (c), to complete pink wave y, and therefore blue wave D. This will be confirmed by movement below 1.1123. At 1.1014 green wave (c) would reach 100% the length of green wave (a), then at 1.0863 it would reach 161.8% of its length. 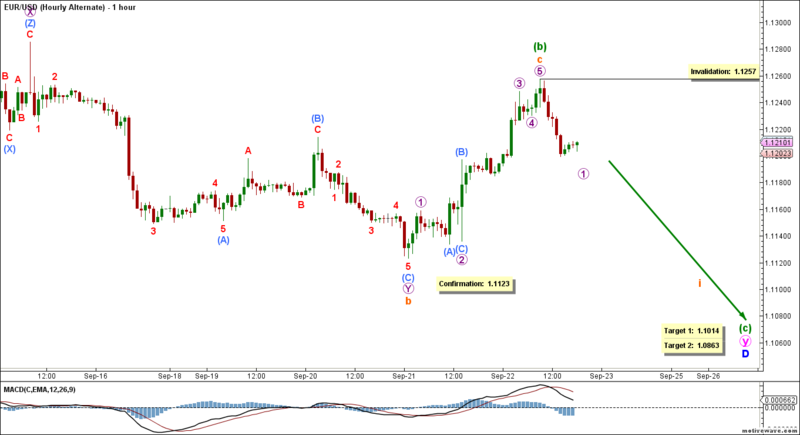 This wave count is invalidated by movement above 1.1257 as violet wave 2 may not move beyond the start of violet wave 1.